See, not very informative. A score might be more than 80% of patients say Usually or Always? That could mean that 19 of 100 people responding are unhappy with their experience. Wow. How can anything be changed based on that result? A person could write a comment on the survey, the person on the phone gave me wrong information. Takes maybe about 1 to 10 minutes. 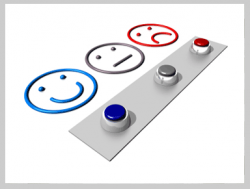 As a quality management lead, I closely examined comments written on surveys. These comments are more informative than scores, especially when the writer leaves their name and we could follow-up. Someone can complain. That can take from about 10 minutes (if you know who to call, what their number is, and have your rap down) to many hours (if you don’t). I combined complaints and comments to better inform survey results. Complaint management is labor intensive and valuable. Mystery shopping (related terms: mystery consumer, secret shopper) is a tool used externally by market research companies, watchdog organizations, or internally by companies themselves to measure quality of service or to gather specific information about products and services. The mystery consumer’s specific identity and purpose are generally not known by the establishment being evaluated. Mystery shoppers perform specific tasks such as purchasing a product, asking questions, registering complaints or behaving in a certain way, and then provide detailed reports or feedback about their experiences. According to a Beryl Institute White Paper mystery shoppers can be on-site as a patient or visitor, be a prospective employee or have a phone encounter. “Patients” will use real life situations tailored to each particular area of the organization, from a physician’s office to the emergency department, to inpatient and outpatient settings. These mystery “patients” may have another mystery shopper accompany them as a family member in order to supply additional details from that important point of view. Visitors’ Perspective Mystery shoppers who are “visitors” to the facility can provide general impressions about directions, clear signage, atmosphere and housekeeping. They may spend time in public areas, listening to and observing staff interactions and other customers’ reactions and comments. A mystery visitor may act as if she is lost in order to assess how well employees respond to both unsolicited and solicited needs. Another valuable source of information is the mystery shopper who poses as a “prospective employee.” Does the organization seem welcoming to the job-seeker? Are his potential co-workers professional in their interactions? How easy is it to find and fill out a job application, either in-person or on-line? How quickly does the organization respond to an on-line application? When organizations spend upwards of one hundred thousand dollars on employee recruitment, it is wise to assess what happens when a prospective employee makes contact. None of this is any good if the organization lacks the commitment to change workflow or training to correct the problems they learn about through surveys, comments, complaints, or mystery shoppers. It’s actually the rare organization that has that commitment to change. Change is tough.